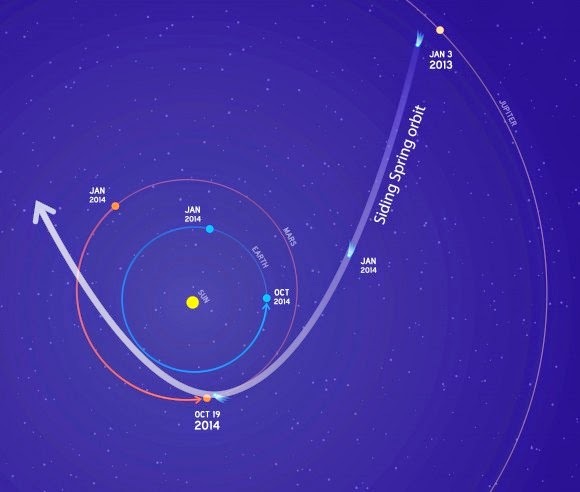 Above is an animation courtesy of NASA by way of the NASA Jet Propulsion Laboratory (JPL) at the assistance of the California Institute of Technology of the Comet Siding Spring ("C/2013 A1 (Siding Spring)") flyby of Mars on 19 October 2014. We've been showing animations from a number of NASA and ESA missions because space is hot in the animation field, but this one is cooler than many. This is simply a cosmic event, no spacecraft involved except as they might get in the way. This will be a close call between the comet and Mars. They will come within 87,000 miles of each other, which in cosmic terms is pretty darn close. Imagine it passed by as close as the moon, only two-thirds closer. That is close for a big hunk of rock travelling that fast. People would be panicking if it were coming that close to the earth. Someday, when the stars align the right way, they will try to inhabit the same real estate at the same time and cause a mighty big explosion viewable across the Solar System, but not this time; maybe in a hundreds of million years - which isn't that long in cosmic terms. It would have to make a pretty precise hit, because it approaches the system at a steep angle to the solar plane in which all the planets (roughly) lie. When you think about the vastness of space, then reflect upon this tiny comet shooting through the solar system and then almost hitting a planet which just so happens to be at that precise spot in its orbit, well, the odds of that are infinitesimal. 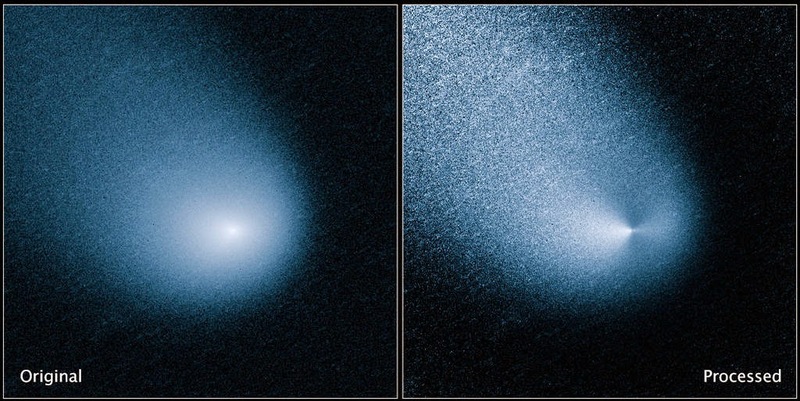 NASA and India have spacecraft orbiting Mars, and they may get clobbered by the dust trail raised by the streaking comet. NASA has done what it could to get its craft out of the way, but anything can happen and we may have an incident. As I am typing this, the comet is exactly 7,493, 600 miles from Mars and closing rapidly. It is travelling at 79,548.55 mph or 35.56 km/s. It has an estimated Visual Magnitude of 10.06, which is still pretty dim - there are 340,000 stars with a brighter magnitude, so you're not going to pick it out of the sky unless you have a really big telescope and know just where to look. In fact, it isn't even the brightest comet. However, that number is going to go down (meaning it will get brighter) rapidly. As seen from Mars, it will get a magnitude of -6, which is fairly bright - brighter than the brightest star, Sirius, which is at -1.4. For comparison, the full moon is -12.74, so it would be between the brightness of the brightest star and the moon - which, for a transient object, is quite bright. Unfortunately, it will not be visible from earth without at least an 8-inch telescope. The comet was only discovered in January 2013 in Australia (they are quite good astronomers down under). It has an orbit of about one million years. The last time this thing lit up the night sky, there were no people and the continents were not in the same spots they are today. NASA is sure to have some pretty good footage of this thing, so we'll probably post that when it becomes available.